NTFS Link is a Windows Shell Extension that provides the functionality to create hard links and junctions on hard drives formatted with the NTFS file system. Hard Links basically make it possible to access one file using multiple paths on the same volume while junctions provides the same functionality for directories with the addition that it can link directories on different local volumes of a computer. A practical example would be to store files and directories in a different location than they have to reside in. This could be the Firefox profile directory, a Skype directory or the Windows Documents and settings folder. You basically tell Windows to look into the original folder but also in the linked folder for files. NTFS Link offers three ways of creating hard links and junctions. The first and probably easiest way is by dragging and dropping a file or folder with the right mouse button to another location. The others are by making use of the New parameter in the right-click menu in Windows Explorer while the last works by right-clicking on an empty folder only. 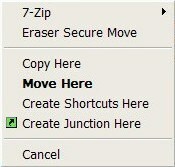 The drag and drop function proves to be really useful and an uncomplicated way of creating hard links and junctions. It should however be noted that NTFS Links works best when run in pre-Vista operating systems as Windows Vista comes with its own possibilities to create symbolic links. One important thing to note here iirc is that if you delete/modify the hardlink you also delete/modify the original and vice verse. Thanks for mentioning it, Wombie. it’s possible I have it wrong, hence my iirc disclaimer :) but my understanding is that you can remove the links and the original will remain but modifications made to the link affect the original I assume this includes deleting. Symlinks and junction points will be orphaned (think of it as a shortcut to a file that doesn’t exist) if the original is deleted however if you delete a junction point (not the original content!) in XP, it WILL delete the original content. XP’s delete functions are recursive and dumb when it comes to determining whether something is a link or the original content. Vista, on the other hand, handles links properly and will not delete the original. I still wouldn’t trust Vista to remove the links correctly so, if I were you, I’d go about the proper means of removing a JP, symlink, or hardlink. NTFS Link hooks into Explorer’s deletion process and tries to unlink symbolic links before it let’s Explorer continue. I would advise not to trust this mechanism though if the symlink is merely a subentity of the strucutre you’re deleting.